Fishing vessels bigger than 15.24 meters in length are prohibited from fishing using towed nets (e.g. 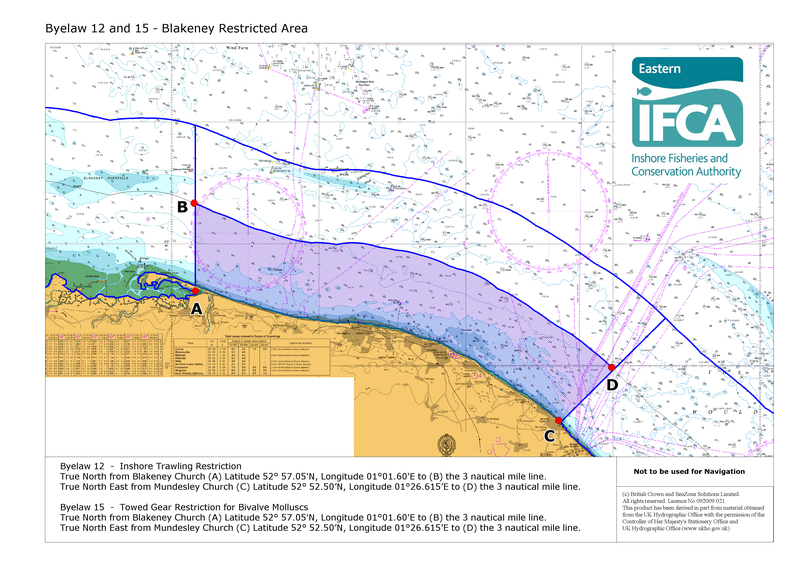 shrimp beams, otter trawls) within 3 nautical miles of the coast (see image left) and all vessels (regardless of length) are prohibited form fishing with towed nets between Blakeny Church and Mundesley Church on the North Norfolk coast (see image below). (b) in connection with a vessel whose overall length does not exceed 15.24 metres in the area between a line drawn True North East from Mundesley Church in the County of Norfolk (Latitude 520 52.50’N Longitude 01 0 26.15’E) to the northern edge of the causeway (Latitude 51 0 55.76’N Longitude 01 0 16.90’E) situated opposite Lower Marine Parade at Dovercourt in the County of Essex to where it intersects the line of mean low water and thence drawn seaward on a bearing 1000 True, being the southern extremity of the District. 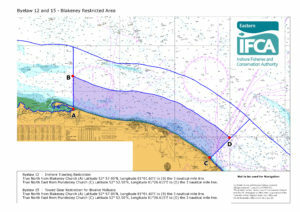 Provided that this byelaw shall not apply to persons using vessels exceeding 15.24 metres in overall length who were engaged in fishing with a trawl net within three nautical miles from the 1983 baselines in the area between a line True East from the control tower at the Royal Air Force Gunnery and Bombing Range at Donna Nook in the County of Lincolnshire (Latitude 53 028.22’N, Longitude 0009.24’E) being the northern extremity of the District and a line drawn True North from Blakeney Church in the County of Norfolk (Latitude 52 0 57.05’N, Longitude 01 0 01.60’E) on a regular basis prior to the advertisement of this byelaw who may continue to fish by the said method in the said area between Donna Nook and Blakeney Church as mentioned above until such time as the particular vessel so derogated changes ownership or ceases to fish. 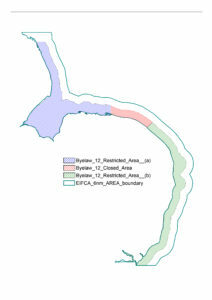 42.40’E) previously derogated which may continue to fish by the said method in the said area between Mundesley Church and Covehithe Church as mentioned above until such time as the particular vessel previously so derogated changes ownership or ceases to fish. For the purposes of this byelaw, “the 1983 baselines” means the baselines as they existed at 25 January 1983 in accordance with the Territorial Waters Order in Council 1964 (1965 111p.6452A, amended by 1979 11p.2866). For the purposes of this byelaw, the overall length of a vessel shall be the overall length as determined by the Registrar General of Shipping and Seamen and shown on the Certificate of Registry of a British Fishing Vessel.